Two things revolutionised my laundry: the first was Sockodiles (if you haven’t discovered them, go hunting at your local supermarket); the second was a large laundry hamper divided into three sections. Sorting the dirty washing as I went saved me an incredible amount of time because I could instantly see when there was enough for a full load of washing. Suddenly my husband started saying things like “I just threw on a load of whites”! Make sorting the laundry child’s play with the Sorting Hamper from Kangaroom – and soon they’ll also be throwing on a load of whites for you. 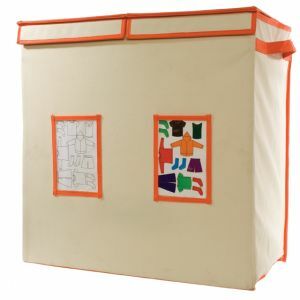 The Sorting Hamper has two separate compartments that can be labelled ‘darks’ and ‘lights’, or with children’s names, so when they take off their dirty clothes they’ll know where to put them. I like the fact that being able to read is not a prerequisite for sorting dirty clothes! Don’t stop with the laundry. Kangaroom has heaps of other nifty storage solutions. Despite having reviewed a number of cord and cable tidys on Babyology, I still like something new and Kangaroom’s version, the Cord Keeper, is really practical. 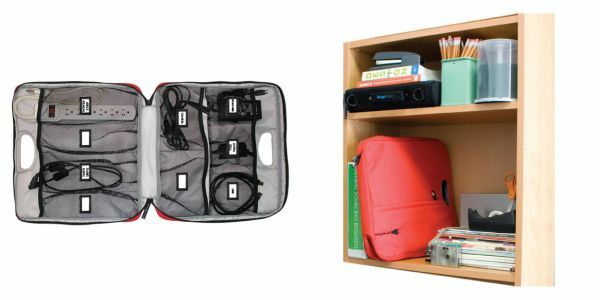 This simple organiser is arranged into a number of sleeved compartments for cords, power strips and transformers and comes with a set of colour-coded labels, all in a sleek, zippered case that can be stored on the bookshelf – neat! Finally, check out the Wally Wall Organizer. This little beauty will sort out every untidy corner in your study. 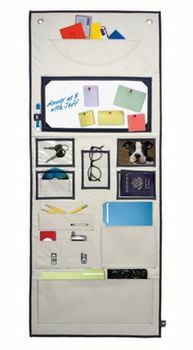 Apart from allowing you to utilise walls or the back of doors as storage space, the Wally Wall Organizer has: multiple pockets, built in transparent sleeves for photos and necessities, a magnet/dry erase board and media pockets with hidden cord slots in the back – so you can charge your gadgets while hiding their cords (wow!). The Sorting Hamper is US$45, the Cord Keeper is US$25 and the Wall Organizer is US$39.99. Kangaroom ships to Australia.